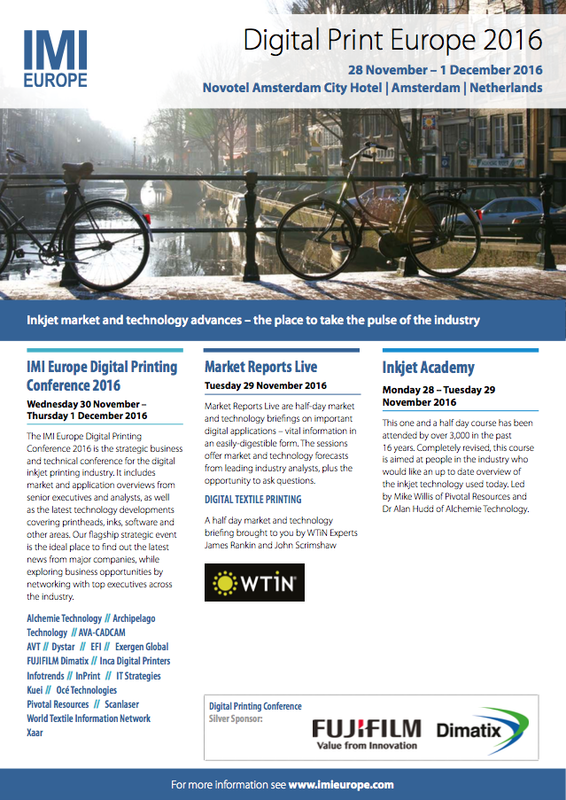 The IMI Europe Digital Printing Conference 2016 is the strategic business and technical conference for the digital inkjet printing industry. It includes market and application overviews from senior executives and analysts, as well as the latest technology developments covering printheads, inks, software and other areas. Our flagship strategic event is the ideal place to find out the latest news from major companies, while exploring business opportunities by networking with top executives across the industry. Understanding the basics is essential to any industry's development. The Inkjet Academy covers the basic theory behind the many types of inkjet technology used today and aims to give your understanding of the industry an expert start. Market Reports Live are half-day market & technology briefings on important digital applications - vital information in an easily-digestible form. The sessions offer market and technology forecasts from leading industry analysts, plus the opportunity to ask questions.